I made a comment on a friend’s Facebook post pretty much implying that she and her writing partners stop making hard work look so easy, it’s not! And anyone who thinks it is, is a fool. These authors are mentors to the many others who are working to succeed. They are dedicated to research, writing, editing, and sharing. Their many books inform and entertain. So I’m taking the opportunity this April Fool’s Day, to salute them. Thank you (left to right) Mary Kay Carson, Kerri Logan Hollihan, and Brandon Marie Miller at Hands on Books. Thank you also to our president Andrea Pelleschi, and to the many other SCBWI members who lift us up every month with their encouragement and support. To my mentors and role models… Happy April Fool’s Day! I suspect the picture book market today can be likened to Grab-n-Go, a popular convenience store serving a fast paced generation. Consumers are looking for fast service, fresh ingredients, and value pricing when choosing a foodservice solution and convenience stores are answering the call with innovative programs that meet the latest food trends. Not in the sense of speedy delivery of sandwiches, but picture books must GRAB the reader on the first page, if not the cover, and GO on to provide high quality literature with a fresh twist at a value price. What are your favorite children’s books? These are books you have Grabbed and Gone with over the years. These are your go-to books. These are the books we give as gifts and reread for our own pleasure. We can recite the first lines of these books. Here is Edward Bear, coming down the stairs now, bump bump bump, on the back of his head, behind Christopher Robin. Where’s Papa going with that ax? The sun did not shine, it was too wet to play, so we sat in the house all that cold, cold wet day. I sat there with Sally. We sat here we two and we said ‘How we wish we had something to do. The night Max wore his wolf suit and made mischief of one kind and another his mother called him ‘WILD THING!’ and Max said ‘I’LL EAT YOU UP!’ so he was sent to bed without eating anything. One sunny Sunday, the caterpillar was hatched out of a tiny egg. He was very hungry. These books stayed with us for a reason… they hooked us into the stories we saved in our hearts. And so whenever we hear these lines we are immediately transported back to the time we sat in someone’s lap, or pushed our way to the front of the group, or felt the joy of reading and rereading our favorite books independently, or probably all three. Now of course, a good opening is worthless without an equally great follow up. These are tied together in our memories. A few words can elicit a flood of emotions and trigger an avalanche of subsequent memories. The power of those opening lines is what keeps us opening those books over and over, rereading those pages, and reliving those adventures like it’s the first time. Did you notice something about all the quotes above? Look at the publication dates. That’s right, for the most part they are 50+ years old. THAT is the staying power of a great hook, a powerful first line, an exceptional story. THAT is what we are striving for as writers! But does that mean there haven’t been any brilliant first lines since 1969? Absolutely not. That’s just where my memory takes me. Where does you memory take you? Let’s look at some of today’s first lines. The most recent books of 2016 are all of two months old. How many first lines do you already know? Which ones do you think will become classics? Will today’s children quote these books in 50 years? Let’s certainly hope so! The books below are listed alphabetically by title so as not to show favorites. Dennis was an ordinary boy…who expressed himself in EXTRAORDINARY ways. Lula Mae wanted a puppy, but Mama said, “Dog’s just another mouth to feed. These are hard times, Lula Mae. You’ve got to make do. When the crickets sing and the end of summer is near, Grandma and Granpa say COME. Peddles was just a pig. I’m running in place, listening to my feet pound the pavement. I never imagined, before you came along… that our house could get this messy and LOUD! 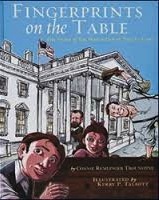 The table is the White House Treaty Table. It was commissioned in1869 by President Grant as a conference table for himself and his seven advisors who formed his cabinet. Each seat has its own drawer with a lock and key. In 1898 it was used for the signing of the peace treaty with Spain ending the Spanish-American War. Since then it has been known as the Treaty Table and another Cabinet Table was built when the president’s cabinet grew to nine advisors. Over the years it has been moved and used by presidents for various reasons. In 1929 President Coolidge signed the Pact of Paris peace treaty on that same table. In 1961 First Lady Jacqueline Kennedy had the table returned to its original place, and in its honor that room became known as the Treaty Room. As more and more treaties are signed on that table over the years, it collects more and more fingerprints of the men and women who work for peace in our country. This is all information which I did not know before this week, before I read this picture book, written by my OLLI instructor, Connie Trounstine. I am proud to have an autographed copy of this book in my library. 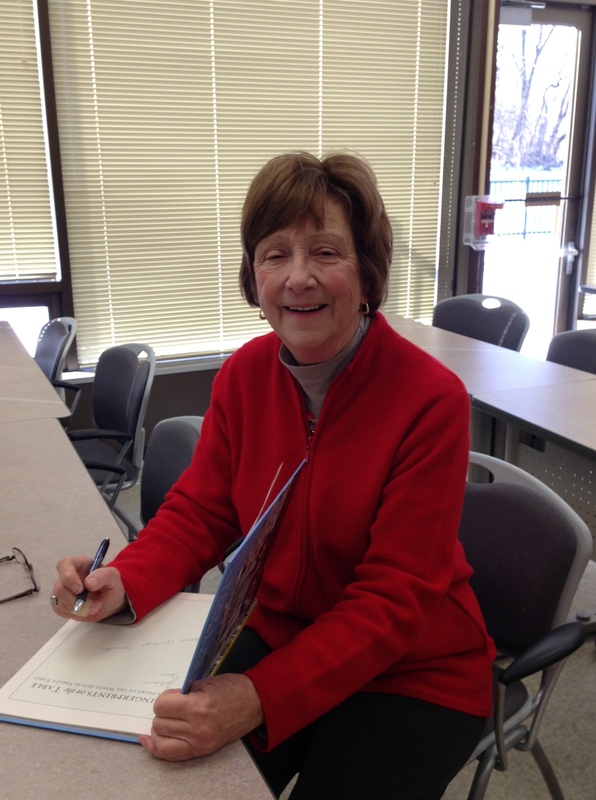 Connie is a wonderful person, author, and instructor, and I am very lucky to have met her. I encourage you to pick up your own copy of Fingerprints on the Table for yourself and for your children.